Hey guys, i was having problems reading resistance values from an NTC thermistor. The adc value would fluctuate a lot. i figured that i go back a few steps and make sure the basics are in order. Firstly my vref voltage was not solid so i bought a precision shunt regulator only to find out i am unsure on how to use it. 2. when i build this circuit as soon as i put a small load on the line then the voltage to vref drops. i thought this is suppose to maintain a constant solid vref but im guessing im doing something wrong. could you guys possibly assist me please? The shunt regulator is a LM336 Z5. The data sheet is very difficult to follow and shows no example circuits. i am unclear of the voltage i must feed it (V IN) and what size pot i must use? i have placed a 500 ohm resistor in series with it because the data sheet says the "IF Forward current 10 mA" this is the maximum current. so if i feed it 5V then 5V/500ohms = 10mA. Figure 4 shows the circuit. "A small load"? What is a small load? Note that the current is sourced through the resistor, so if the load causes the voltage to drop below 2.5V, then what can the lm336 do? Reading a NTC is normally ratiometric, so adding a precision reference will make no difference. I'd suggest the problems are elsewhere. When I say small load I put a 10k resistor on vref and ground. I am confused as to how this regulator works? If the VIN voltage changes slightly then so will the voltage on the adjusting pin so the voltage to vref will then change? Is 5v at VIN fine? Should I use a higher voltage? Figure 4 doesn't show the adjusting pin? Is it not necessary to use the adjusting pin?Figure 4 is also marked as LM136? Is this the same as the LM336? Is it correct if I say that the adjustment pin is used to alter the zener breakdown voltage which then changes the regulated voltage? What is figure 19 for? I am not questioning your knowledge I believe you when u say figure 4 is the one I must use, I just don't see how I am suppose to see it? I mean it's named differently and it doesn't show the adjusting pin anywhere? "Reading a NTC is normally ratiometric, so adding a precision reference will make no difference. I'd suggest the problems are elsewhere." Thank for the advice Kartman. Should I forget about this then and just use a linear voltage regulator? I was using a 5v cellphone charger to directly power the microcontroller without any voltage regulation. So I thought this could possibly be the issue as the voltage was not perfectly stable. Is the internal 2.4v (is it 2.4v? I can't remember) of the atmega328 a stable voltage? What do you mean when u say the NTC is ratiometric? Unless you want to trim the reference voltage, leave the pin open. The lm336 is like a zener diode - it will pull as much current available to keep the required voltage. If you let it pull too much current, it will melt down. The adc result is the ratio of the measured voltage and vref. With the ntc you usually would put a resistor in series with the ntc. The top of that resistor goes to vcc and you would select vcc as your reference. Thus is vcc changes, the voltage from the btc and resistor changes accordingly. Thus the actual vcc voltage is immaterial. Thus ratiometric - measuring the ratio. 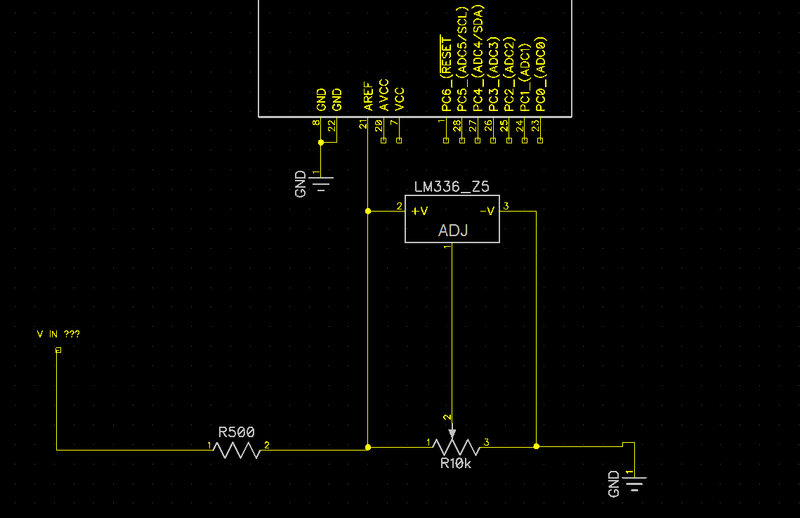 Sketch up a circuit and solve the voltages and the adc value. Change the vcc and recalculate. The adc result stays the same. If you were measuring a battery, then you might want a better reference. I'd suggest the problems are elsewhere. I think your summation is way too general. I agree with you Kartman.